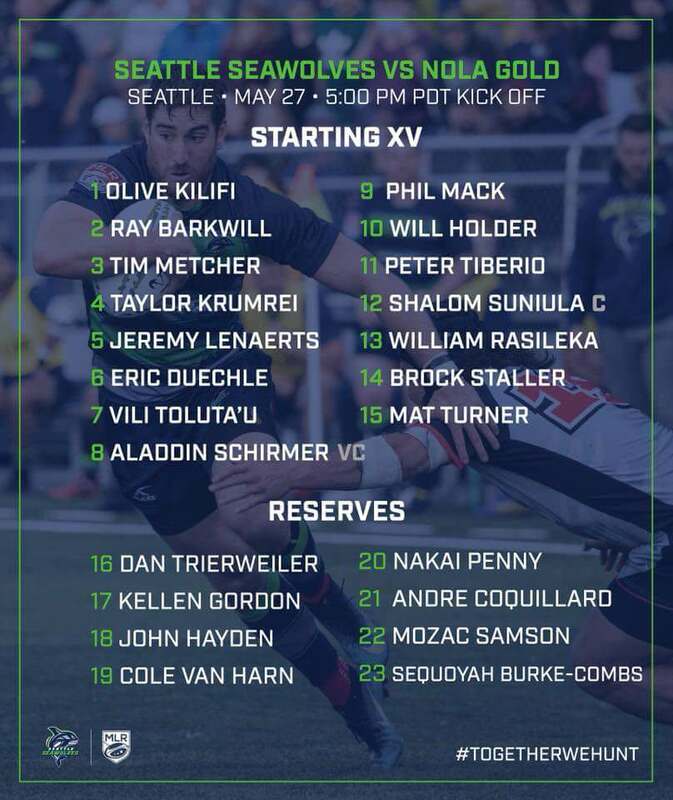 In a rematch from two weeks ago, NOLA Gold traveled to the Pacific Northwest to take on the Seattle Seawolves. Seattle scored seven tries on their way to a dominant victory. Outside of a 10 minute stretch, NOLA looked like nothing more than a speed bump in the way of Seattle. The scoring started quickly in this match. The Seawolves were on the board in the first minute of the match. After a line break from Will Holder, Brock Staller was in position for the offload and took it in for the try. Staller added a second try just a few minutes later. Seattle overpowered the NOLA scrum and worked the ball down the field into Staller's hands for the try. Eric "The Beast" Duechle added the Seawolves third try in the first ten minutes of the match. After NOLA rushed up on defense, Seattle went over top into Duechle's hands who ran through multiple NOLA tackles on his way to a try. NOLA was able to finally show some life in the match. They worked their way forward through pick and go phases. Eventually John Sullivan was able to push his way over the try line to get NOLA on the board. Brock Staller added to the Seawolves lead with a penalty kick from just to the right of the posts. The Seawolves continues to make mince meat of the NOLA defense as Mat Turner added the Seawolves fourth try of the first half. Turner received the ball out of the ruck and weaved his way over 50 meters for the try. 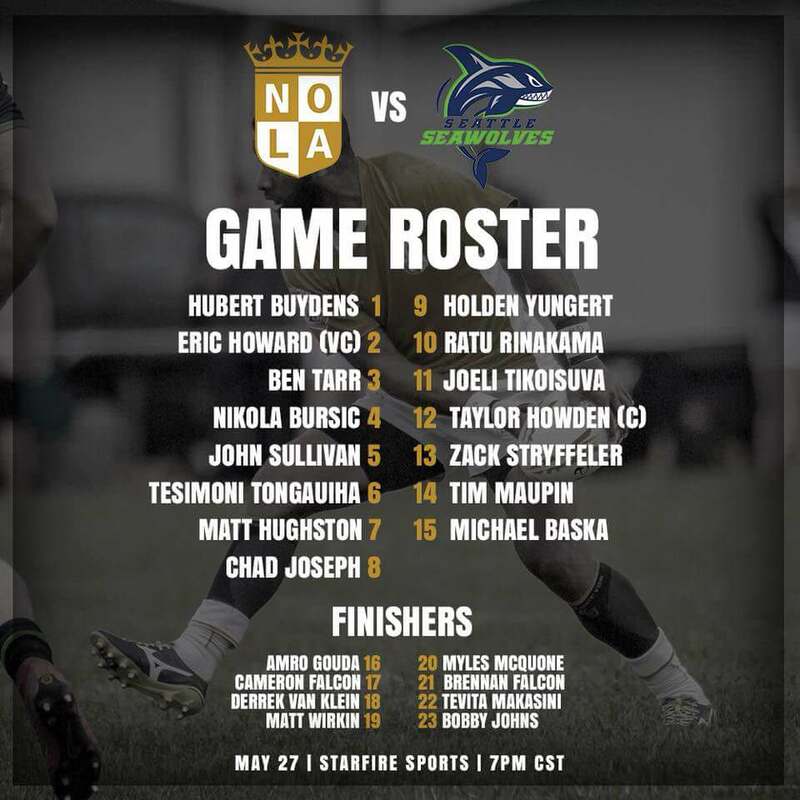 NOLA continued to give the Seawolves chances for points and they took them. This time Brock Staller however missed his penalty kick, pulling it to the right of the posts. NOLA got a little help near the end of the first half by way of penalty try. After kick down to the five meter line, NOLA mauled their maul towards a try. Brock Staller came in from the side on the maul causing referee Chris Assmus to award a penalty try to NOLA and give Staller a yellow card. NOLA was able to take advantage of the yellow card almost immediately. Once again using the pick and go phases to get over the try line. Tesimoni Tongauiha was the man who dotted down for the try. Tongauiha has really adapted well to the flanker position after being moved from the center position. A really bad start to the first half had NOLA on their heels. Seattle came out fast, pushed the pace, and made NOLA look like an amateur squad. NOLA was able to hit back at the end of the first half and give themselves some momentum. Seattle looked like they were going to run away with the match in the first half, but left off the gas. The Gold came out firing in the second half. NOLA looked like they were going to score through pick and go phases, but they went wide to Michael Baska for the try. This was the second NOLA try with a man advantage. Taylor Howden missed the conversion and NOLA trailed by an unconverted try, 31-26. Will Holder took over the kicking duties while Brock Staller was in the sin bin. He converted a penalty kick to give the Seawolves a two score lead, 34-26. Taylor Howden had a chance to get those points back, but his penalty kick attempt stayed right of the posts. Seattle did to NOLA what NOLA had done to them a few times in the first half. The Seawolves mauled their way over for a try, with Aladdin Schirmer being the man at the back of the maul to dot down for the try. Dan Trierweiler looked to put the game out of reach for Seattle. Seattle broke through the NOLA defense and got down within the five meter line where Trierweiler was waiting for the offload and got over for the try. Seattle finished this game just as they started with their foot on the gas. Mozac Samson found the space in the NOLA defense and offloaded to Mat Turner for his second try of the match. Brock Staller added the conversion that gave the Seawolves a 55-26 lead. Seattle bullied their way over NOLA in this match. They made NOLA look like an amateur squad at points. They were there in support and in the right place at the right time on their tries. They had their let up when Brock Staller was shown a yellow card, but when they had a full contingent Seattle was unstoppable. NOLA can take very little away from this match. The only good game film that the Gold have, took place in 10 minute window around halftime. Their defense looked like a block of swiss cheese. There offense wasn't in sync and when Seattle went on their run, they didn't have a response. NOLA will have to go back to the drawing board if they want to have a chance at the playoffs. NOLA heads back home as they host the undefeated Glendale Raptors on Sunday, June 3rd. Seattle has a short week as they are set to travel to Texas to take on the Houston Sabercats in the CBS Sports Game of the Week on Saturday, June 2nd.